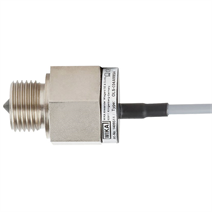 The model OLS-C04 optoelectronic level switch is used for monitoring the level of liquids. The optoelectronic sensor consists of an infrared LED and a light receptor. The switching status can be read directly on the sensor (yellow LED). The model OLS-C04 level switch can be used in refrigeration plants, since the glass prism is fused within the steel case.